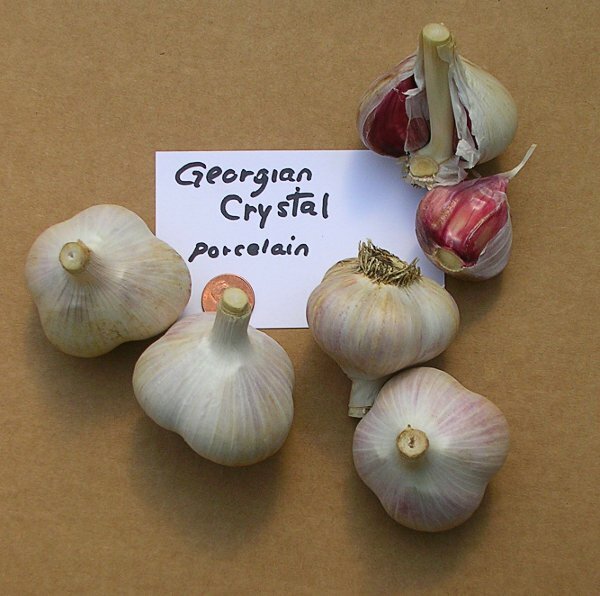 Georgian Crystal garlic is a Porcelain variety than can produce very large bulbs and plants. Photo courtesy of Teltane Farm. Georgian Crystal garlic is a Porcelain variety that is known for its large size, rich taste, and ease of growing. Lik other Porcelains, it prefers a colder climate but some growers have noted that Georgian Crystal also fares well in warmer climates, much better than Porcelain varieties in general. Georgian Crystal garlic bulbs can be very large — to the point that it is sometimes mistaken for elephant garlic. Bulbs can top 3″ in diameter and it usually produces 4-6 very large cloves per bulb. Georgian Crystal has a full-bodied taste without being overwhelming, making it a popular choice for chefs and cooks. 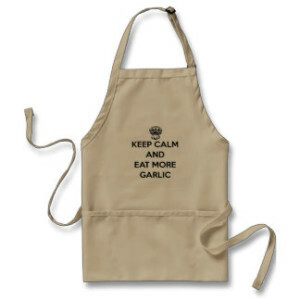 As the name suggests, this garlic originated in the mountains of the Republic of Georgia, the general area believed to be the ancestral home of all garlics. Like other Porcelains, Georgian Crystal usually matures and is ready for harvest in mid to late summer, with its long storage life meaning it can still be good through spring of the next year in most seasons.